So you’re a risk taker? No. Actually, I’m a scared-y cat. But I’m working on opening myself up to new experiences. I recently learned to ice climb. Just before we were about to descend into a gaping crevasse, I was in a state of panic. I’m terrified of heights and felt sick at the challenge. But then I asked myself, “What would it look like/feel like if I wasn’t afraid of heights?” I went ahead and descended the ice canyon, and then climbed the ice-covered rocks using ice picks and crampons. The fear didn’t fully leave me, but I was able to concentrate on climbing and having a new experience, rather than focus on how afraid I was. The bottom line is this: I want to have a big, rich life. And the only way I can do that is to not let my fears rule me. What did you young adult kids say when you ‘came out’ as a biker? They thought I was crazy at first, and the truth be told, so did I. That’s part of the reason I did so much research into the neuroscience and psychology of risk taking for the book. It was my way to try to explain to myself what was happening to me and why, neurologically, biochemically, psychologically. Now, they brag to their friends about how badass their mother is (but both they and I know that’s not completely true). 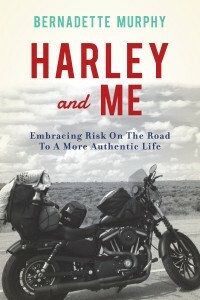 Your current book is about risk taking, women and motorcycles, and your earlier, bestselling book was about knitting. How do you go from knitting to motorcycles? Those two books are actually more similar than I realized when I was writing them. Ultimately, they’re both about living life fully, trying things that are new and unfamiliar, being able to accept and even welcome failure, being down with the whole human condition thing. Learning to knit, for me, involved risk. It challenged my notions of who I was and what I was good at. The motorcycle did the same thing, but in a bigger, brawnier way. Both knitting and motorcycling, though, helped me become more alive in the moment. They did wonders for my neuroplasticity and opened me up to new experiences. And isn’t that what life’s really about? BERNADETTE MURPHY writes about literature, women, risk taking, and life—from motorcycles to knitting. Her newest book, Harley and Me: Embracing Risk on the Road to a More Authentic Life, will be published in May by Counterpoint Press. 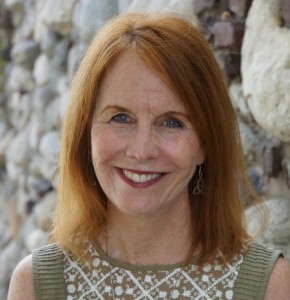 She is an Associate Professor in the Creative Writing Department of Antioch University, Los Angeles and a former weekly book critic for the Los Angeles Times. She writes essays on life and literature that have appeared in Ms. magazine, Los Angeles Times Magazine, San Francisco Chronicle, The Rumpus, Palm Springs Life, Role/Reboot, The Manifest Station, The Oregonian, San Jose Mercury News, Newsday, BOOK magazine, and elsewhere. Her essays and short stories have been in featured in anthologies, including: Knitting Yarns: Writers on Knitting, edited by Ann Hood; A Pink Suitcase: 22 Tales of Women’s Travel, edited by Janna Graber; Wild with Child: Adventures of Families in the Great Outdoors, edited by Jennifer Bove and Mark Jenkins; My Little Red Book, edited by Rachel Kauder Nalebuff; Our Working Lives: Short Stories of People and Work, edited by Larry Smith and Bonnie Jo Campbell, and others. She holds an MFA from Antioch University, Los Angeles and is the mother of three amazing young adults.